Hey there! Super quick post today, because my newly retired mother is on her way up to New Hampshire as I type (this is Thursday morning) to give the Handsome Husband and me a 3-day getaway! Gotta get the laundry done, so here we go! First, a big thanks to editor Annie Thornton at Houzz.com who featured Home Glow’s “Ultimate She Shed” as the Room of the Day on Sunday! It was also picked up by MillenialBoss.com in a roundup of She Sheds and featured on Tiny House Magazine’s Instagram feed with nearly 2K likes. Hooray! This post is for those of you that feel that custom upholstery is beyond your reach. Whether or not the style is appropriate for your home, I think it’s very nice looking and it’s well made. It’s from Serena & Lily, and all of their upholstery is fabricated by Lee Industries in North Carolina. If you aren’t working with a designer and don’t have access to to-the-trade items, S&L’s upholstery is a good choice. They offer some Perennials performance fabric choices, and the pieces are made with hardwood, mortise & tenon construction. 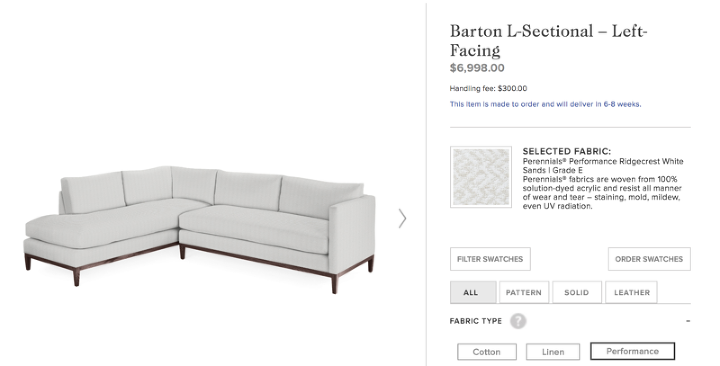 So what is the price tag on this sofa when a performance fabric is added? Now, I don’t think that’s an unreasonable price for American-made goods and for such a large item. But I have a secret for you…. You can get a sectional that large with Better Construction and CRYPTON fabrics … for a terrific value. In fact, you can customize your sectional down to the arm style, foot style, cushion style, skirt style, number of cushions, and more! Duralee is more than a fabric company. It has awesome, super cute, super well-constructed made-in-America upholstery as well. But, combine its powerhouse fabric selection with upholstery and — BAM — you’ve got a really good product. The reason is this — there is a special fabric pricing program when you select a Duralee frame and put a Duralee (or Robert Allen, now that the 2 companies have merged) fabric on it. For a great value. Not too shabby. The above may be a *little* too patterned for some of you, but you get the idea. You can even have a super-duper stain treatment applied to the fabric. But what I love even more is Duralee’s Build-Your-Own program. Now, lots of upholstery vendors have BYO programs. What is that, you ask? Well, it’s where you can choose almost every specific element from a list of choices, all for the same price. Courtesy of The Robert Allen Duralee Group. Used by permission. The frames include more than just your standard options — there are all different kinds of sectional configurations, lengths, depths, you name it. Moreover, you can get Gold-Standard upholstery things like spring-down cushions, down blend back cushions, coil-spring construction all at no extra charge. Now, compare that to Big Box offerings! Finally, 3 of Duralee’s own Crypton fabric collections come as graded-in options! And, as in the above Tilton-Fenwick covered sofa, all other Duralee/Robert Allen fabrics are part of the special fabric pricing program. My clients in Project NH Lake Camp will be taking advantage of Duralee’s BYO program. 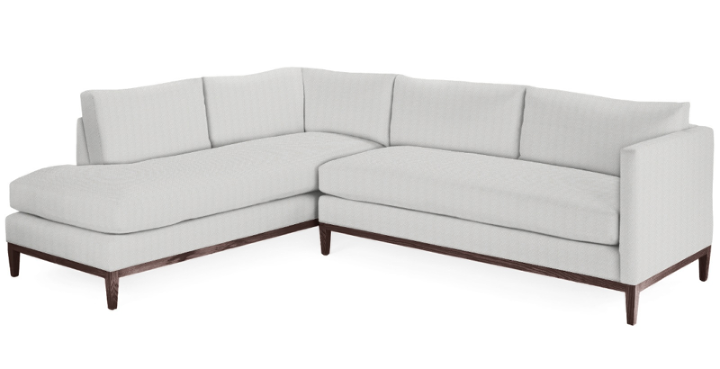 We’ve designed a 96″ sectional with a long chaise and 2 bench seats, complete with spring-down seat cushions and down-blend back cushions. This is the mock-up that was sent to me by the factory. We’ll be using a rolled J-arm, loose box back cushions, and a tapered leg to go with the ’50s era cottage the clients are renovating. We took advantage of the Crypton program and chose this soft, subtle diamond pattern for the fabric. I can’t disclose prices. It’s contractual information, I’m afraid. But the prices are very, very good. Trust me. “How? Where can I get this?” you ask. Yep, it’s another one of those things where you have to work with a designer to get the goods. I’m not trying to trick you, but I want to let readers know what’s out there. I started my business because I knew what I saw in the magazines didn’t come from a big box store and wanted to help families create their own unique, character-filled, and quality-furnished homes. 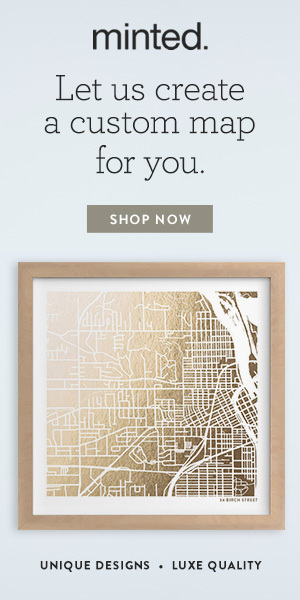 ….And let them know that the home they wanted wasn’t necessarily financially or stylistically out of reach. What Decorating Help Do YOU Need? Consultations for those who are pretty confident but need a little tweaking/direction. I would also love to think out of the box — are there are other ways that I can help clients? What are your difficulties in decorating your home? What do you wish you could have a decorator do for you? I’d love to hear your thoughts!